Ukuleles are such a great way to teach concepts like melody, rhythm, harmony, form, and style. They’re also a great way to actively engage students in music making. As the new year begins, here are some of the things to think about as you prepare for your ukulele unit! I store my ukuleles in cases all summer, so as I begin to set up my room, checking each instrument is really important. I want to make sure they are in good playing condition for my students. As I take out each instrument, I check it over carefully. I make sure that the strings are good, the tuning pegs and bridge are in great condition, and there is no damage to the body of the instrument. Every once in a while, an instrument chips from being tapped upon one of our stools. I use a paint pen to touch them up so it’s not as noticeable for the next student to use it. No matter the size of your room, having your instruments accessible to students is a must. I don’t have a lot of storage space in my room, so I had to get creative about storage. I had deep closets, so I was able to use a Rubbermaid Fast Track System to store them three deep (I also lined the hooks with pipe foam so they would be snug at the neck and not hang from the pegs.). I’ve seen some amazing storage set-ups from ukuleles stored on a classroom wall using hooks to ukulele carts. Regardless of the space in your room, find a way to store the ukuleles that makes them easy to get at by your students. This is a tricky one! I’ll be honest, for the first four years of teaching, I didn’t put any chord markers on the fret board. I wanted students to learn and be able to play without visuals. But this past year, I watched many of my students struggle and get frustrated finding the “right” place to put their fingers.. I know that some people use stickers to mark the chords on the fret board. I chose to use a paint pen instead because I wanted something more permanent than stickers, so I bought a simple paint pen set at a craft store and marked the C, F, and G chords. With those three chords, students had a visual reference for C7, G7, and Am without marking the fret board up completely. You’ll have to decide what is best for your students. If you want to try stickers, check out my friend Shelley’s chord dot sets for ukulele at Pitch Publications. Use paint pens to make different chords on the fret board! This is my least favorite thing about teaching the ukulele. Who has time to tune 30 ukuleles?!? If you’re just starting out, get yourself a string winder and start stretching those strings! (And expect to tune often for the first few weeks of play.) If your ukes are “broken in” then you know that tuning doesn’t take too much time. As I unpacked my ukuleles from summer storage, I tuned each one and ensured there were no buzzing strings. I highly suggest having some SNARK tuners to tune your instruments. There are many apps and online tuners, but those can be difficult to manage when trying to tune quickly. The SNARK is small and tunes by vibration, so that no matter the level of noise in the room, you get an accurate tuning. I train a few 5th graders each year to help me tune on Mondays before school starts. Whether you have a few or a class set of ukuleles, I highly recommend that you label your ukuleles. I have Mahalo ukuleles in 5 different colors. For many years, I used a Sharpie and simply numbered each color set 1-6. I found that over time, the Sharpie would wear off and I would have to relabel the ukulele. Last year, I cut vinyl numbers using my Cricut and labeled each ukulele. By labeling the ukuleles, I can then assign them to students and track any issues with the ukuleles. Vinyl numbers cut using a Cricut. I highly recommend that you assign each student a specific ukulele. It gives that child ownership of the instrument and helps you track the usage of that instrument over time. Every once in a while, a student will take it upon him/herself to “tune” the ukulele for me. We usually discover it when the next student plays the ukulele. By knowing who uses each ukulele from class to class, I am able to address the issue with the student. Assigning ukuleles also helps me to know when an instrument has been damaged and who may be responsible for it. It serves a safeguard for me and the students. Did you know that you can use picks on your ukulele? Not the plastic guitar picks, but felt picks specific for ukulele! I don’t allow my students to use them at the beginning of our unit as I want them to build a little strength and callous on that strumming hand. As we progress and play more consistently, I give my students the option to use a felt pick. I love Bolo picks. They’re a bit on the stiff side, so you get more life out of them. As they wear down, you can restiffen them. I often wash them first, then do the stiffening process. Please note – it takes 2-3 days for the picks to dry thoroughly! 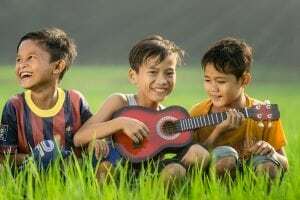 Once those ukuleles are prepped and ready to go, it’s important to find the right curriculum to sequence your ukulele instruction. There are lots of fabulous curriculums out there, but take into account how and what you want to teach first! My students get the ukulele in their hands and immediately want to “make music,” so I begin with strumming first. We learn a few basic chords (C7, C) lots of strumming patterns, and many simple one-chord folk songs. As my students progress and become more comfortable on the instrument, I move into TAB and fingerpicking. I like to begin with folk tunes and connect what we’ve learned with harmonic function to our playing. Then we begin moving into pop tunes for the ukulele. My favorite site for ukulele play-alongs is Dr. Jill Reese’s site on YouTube. If you’re looking for some easy, CLEAN pop songs for your students, you might check out my blog posts, Favorite Pop Songs: C, F, & G Edition and Favorite Pop Songs: C, F, G, & Am Edition. It’s going to happen at some point – you’re in the middle of your ukulele unit and you have to be absent from school. I don’t allow my student to play instruments without me present. (I’ve leaned the hard way.) . So what do you do? Have your students learn about the history of the ukulele. Find some great ukulele resources, worksheets, centers/workstations for your students to do while you’re away. It’s a great break for your students, while still engaging in the process of learning about the ukulele. My students love to watch videos of Jake Shimabukuro and Honoka & Azita on YouTube. Show your students how the ukulele is made by doing a “virtual tour” of The Ukulele Experience at the Polynesian Cultural Center in Oahu. What do you to do to prepare for your ukulele instruction? Leave me a comment below to share your ideas! Thank you for this information! I am going to use it with my granddaughter and maybe church choirs. Love it! Fabulous article on Ukulele care! Very helpful! Thanks for all the great advice, Jennifer! This was so very helpful! This will be my first year teaching Ukes and I’m so excited! Thanks for all of the great tips! Thank you for the very useful article! I love the idea of using paint pens to anchor chord positions! Well thought out and incredibly resourceful for educators using ukuleles! What a great, practical post. Thank you! Your article is really good for teaching the ukulele. I have been benefitted to read the article. Thanks.